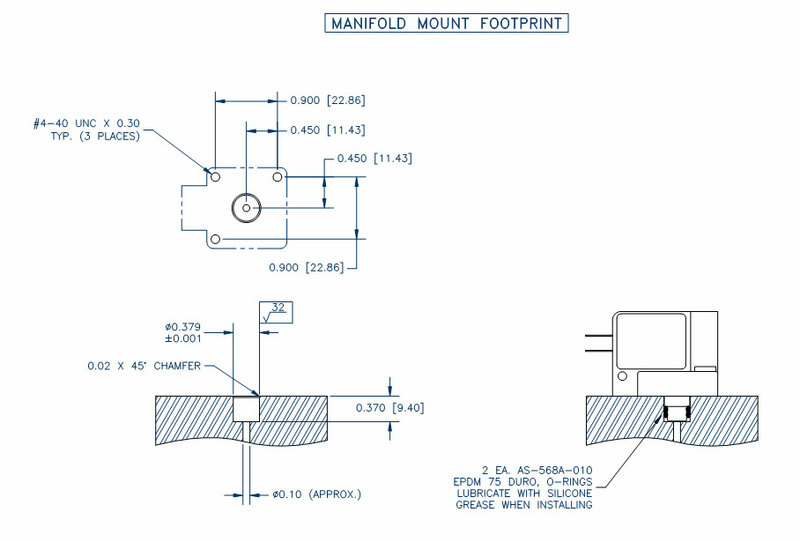 Application Note #2 - Manifold Mount Switches • Airtrol Components Inc. Most Airtrol Components’ pressure and vacuum switches are available in manifold mount configurations. Figure 1 shows the recommended manifold detail. Attention must be paid to the tolerance and surface finish of the .379 ID. Two EPDM 75 durometer O-rings are supplied with each unit. Two O-rings are recommended in case of surface imperfections, damage to an O-ring during assembly, etc. The O-rings must be lubricated with silicone grease during assembly. This not only eases the assembly procedure, it also enhances the sealing characteristics of the O-ring, especially in vacuum applications. Typically, #4-40 x 5/8 SHCS are used to mount the switch to the manifold. Avoid overtightening the screws during assembly. “Threadlock” compounds should be avoided, as most will attack the polysulfone switch body. For further information, contact an Airtrol Applications Engineer at 1-800-762-0758.